We set out on a bicycle tour of Berlin the next day and spent the best part of the Sunday morning pedalling around the city learning about its chequered (and often harrowing) history. 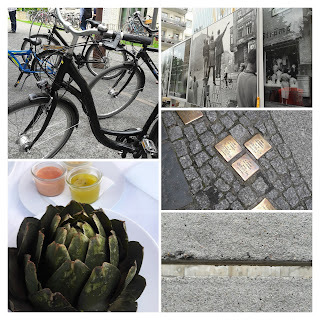 The tour took us through all the major sightseeing points of the city - Brandenburg gate, remnant of Berlin Wall, Checkpoint Charlie - without overwhelming us with detail. We stumbled upon a food festival at the Kulturbrauerei where dropped our bikes off and gorged on burritos, pasta, churros and ice cream before heading back to the hotel for a snooze. That evening we took the tram (bargain at 7 Euros/day/1 adult + upto 3 kids) and decided to stop off where we felt like it. We got off a couple of stops later at what looked like a massive park. The Volkspark Friedrichshein is a beautifully landscaped green space, a stone's throw from Alexander Platz. It boasts a vast expanse of green, a few gently sloping ponds and a very welcoming restaurant. We seemed to have stumbled upon a gem. Walking around the park, I noticed a small group of friends having jamming. They had strung some festoons across two trees, laid out a picnic and were making music. It seemed such an idyllic summer scene. I'd arranged for a running tour early the next day morning but the tour guide cancelled citing injury and we narrowly missed our city boat tour later that morning. This meant that we could spend a few hours indulging in the great Western pastime of shopping. Given that there was a Decathlon a few hundred metres away, we succumbed and ended up spending a rather silly amount of money. We took the quiet carriage on our train journey back and that gave me time to think about the various experiences of the weekend and also sink my teeth into the book that was long overdue. We booked our cycling tour through Doggy Bag Tours who were fantastic. They can be found here.